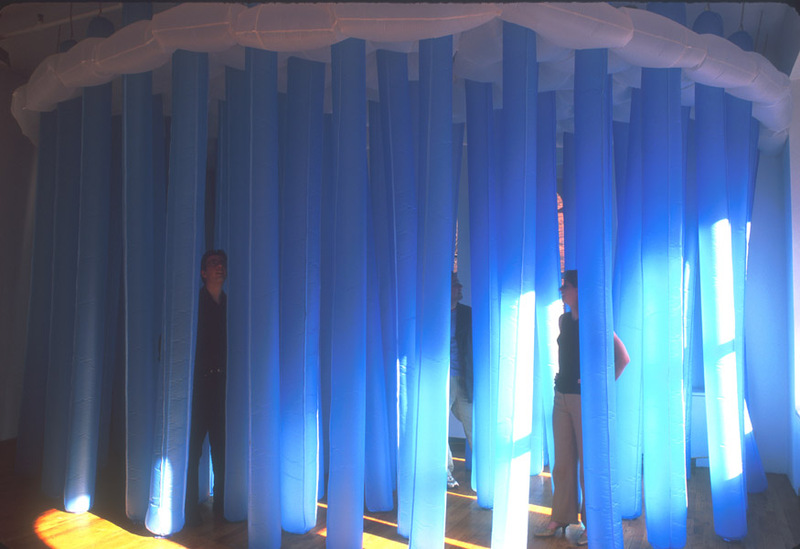 “Slurry”, 2001, 24’x11’x12’; nylon, blower webbing. Produced for Independent Curators International show “Thin Skin”. Work acts as entryway/ gate through which to enter the museum. Work is modular and breaks down into three separate sections. By Karin Cuoni from exhibition catalog: Thin Skin: The Fickle Nature of Bubbles, Spheres, and Inflated Structures. Exh. cat. New York: Independent Curators International, 2002. Essays by Barbara Clausen, Carin Kuoni, and David Barthelme. 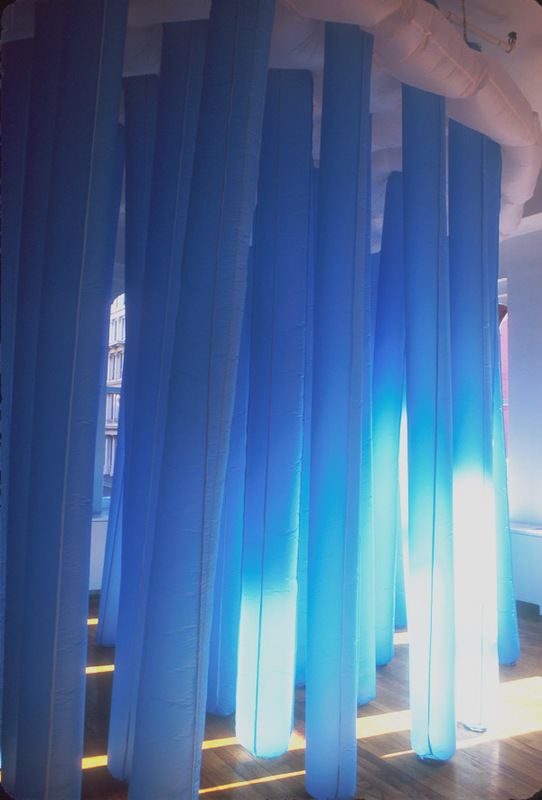 For the past six years, Boroson has created site-specific installations, usually with inflatables, that illuminate patterns of human navigation. In exploring the phenomenon of “flow”—as in movements of people, water, or air—he is particularly interested in the literal boundaries of such movement, the borders and transitions between the static and the mobile. The ever-shifting relationship between these two states gives his large, even monumental installations an unexpected sense of fragility. 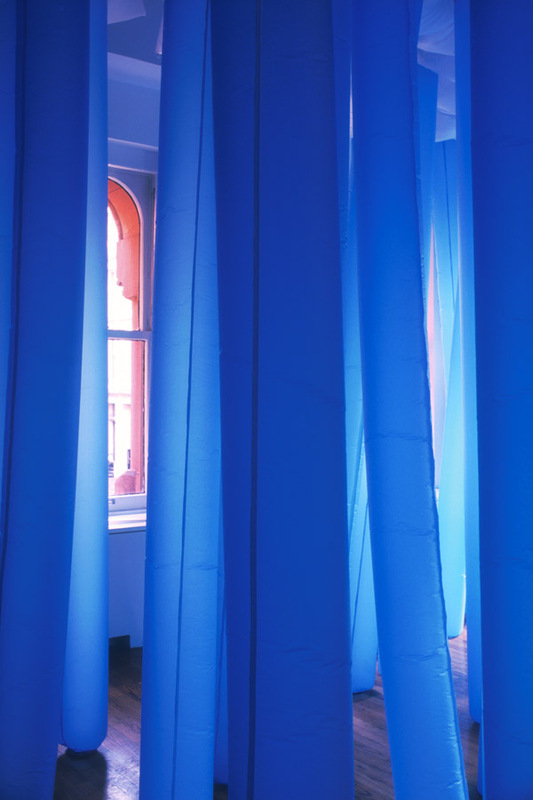 Yet the material used is solid and, according to Boroson, “could last forever.” The sense of temporariness stems from the installation’s creation of an undefined zone: no fixed points, no orientation, everything in flux. In several ways, Slurry constitutes a new development in Boroson’s work. The old Cartesian axes are gone; above our heads, a “cloud” hovers. In addition, this is the first work of Boroson’s that was conceived of to function in a generic role, as an entryway to the exhibition, in a variety of different spaces that were unknown at the time either the work or the show was planned. This new disconnectedness allows Slurry to perform on a more abstract level than his earlier works. Its ambiguous, complex nature is enhanced by the dissolution of distinctions between geometric and organic (the columns are neither), outside and inside (the work is situated in a transitory passageway between hall and gallery), solid and void (the columns are essentially filled with nothing), shell and support (it’s unclear what is supporting what, or is suspended from the ceiling). The columns feature identifiable elements, but they are perceived neither as architectural forms nor as tree trunks. The inner seam air-seals the column so it can contain the air; the outer, slightly diagonal seam gently twists the column body, rendering it quasi-organic—the columns have become, as Boroson says “forms that don’t exist.” His interest in how memory is tied to space is played out by this ambiguous multiplicity of references. Not least by focusing on the entrance passageway—any doorway echoes the general proportions of the human body—Boroson affirms the body as sensual carrier of memory between outside and inside. Amusingly, and oddly self-abortive, the few figurative references being made relate to things that are illusions: The foyer is not a shelter, but rather a non-functional simulation of a shelter, a box within a box, a skin within a skin. The drop ceiling doesn’t really drop. It’s not a cloud, either. And even if it were, the cloud is simply “a different constellation of the same elements as the air around it,” as Boroson points out. Air must be the richest accumulation of nothingness there is. Here it has been elevated to an active agent, for it is air that gives this work its form. And it succeeds in providing the viewer with an experience he or she would not otherwise have, like walking on water or floating on clouds, or experiencing a zone that has neither shape nor weight. In a sense, Boroson provides a rarefied, spiritual space. 1. All quotes by Boroson are from a conversation with the author, October 12, 2001.